Design and plant placement can sooth a stressed mind, boost serotonin and provide a space for meditation and reflection. I’ve always believed that if you have a dream that is creative and unselfish … (by this I mean creating something that will benefit the wider community) then it will come to fruition when the time is ripe. I’ve been gardening since I was a child. First, with wonder and awe as my parents took me to garden centres to pick out annuals and then help my mother as she joyfully planted them. In my early teens being with my father as he taught me how to graft fruit trees, prune and transplant perennials. And how could I forget the many trips to Niagara to pick fruit and can countless jars of peaches, pears and cherries. As Dan Bisonnette and I stood in the 50 x 45 foot space that I wanted to turn into a Healing/Meditation Garden, I saw him shake his head a couple of times. Then, as the workshop participants joined us he pointed out what was fundamentally necessary for a healing garden and what our challenges would be. Drawing on his knowledge of Japanese and European monastic gardens as well as First Nations healing traditions and modern therapeutic techniques, Dan began to explain to us what should be included and what should be avoided in our new garden. As he spoke we wondered how this space could heal people. To our surprise it has turned into a beautiful healing space over the past three growing seasons. Healing/Meditation gardens should be free of all electronic noise including phones, devices or sound systems. A gentle wind chime will add a whimsical feel to the space but also remind us of nature as the wind gently blows. When my father passed away at the time of our garden creation, I purchased a windchime and hung it in the white oak tree in the garden in his memory. The garden should be reserved for quiet conversation, meditation, reading or prayer. There should be a defined entrance to the garden, creating a spiral to the centre. This was a challenge for us given that we had to incorporate two concrete walkways in the garden. But, with some creativity, we mapped out a grassed entrance flanked on both sides by gardens. We raised one of the beds to create depth and block the view of the centre of the garden from the walkway. The curved entrance to the garden encourages visitors to enter in. A member of the congregation surprised me with a black metal arch for the entrance which had been custom welded from recycled metal. We grow vines and sweet peas up the arch to create a “secret garden” effect. Water is an essential component of any healing/meditation garden. Any fountain or water feature will need an electrical outlet. We were fortunate to have the perfect corner for a fountain which we purchased for 70% off when a local garden centre was closing. 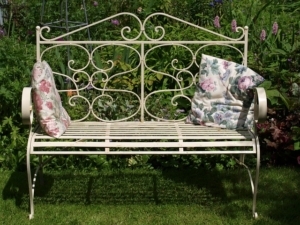 To make it a focal point we placed a metal trellis behind it and grow ivy around it. Every day we enjoy the variety of birds that come to the fountain for a drink and a bath. Healing/Meditation gardens need shade. If you create a garden without shade you will find that people will not use the garden. We have a beautiful white oak that provides shade for most of the day until about 2 pm and then in the evening. If you don’t have trees you could create a shaded sitting area with a wooden pergola. A very sturdy one could support some beautiful flowering vines. I don’t recommend patio umbrellas. Every garden needs seating. We purchased wooden benches with backs to encourage visitors to stop and stay for a while. We varnish them every year so they maintain a natural look and store them in a garden shed for the winter. The benches are made of bamboo so they are light and easily moved about the garden. 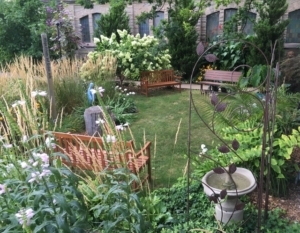 While lots of shade attracts visitors, a healing/meditation garden needs a vista. In other words, you need to see the sky. One of our challenges was to obscure the church parking lot. The parking lot side of the garden is banked and tiered. A row of Karl Forster feather reed grasses have been planted in the tiers along with native plants, hostas and a few annuals. This embankment creates our vista while blocking the parking lot and the movement of the grasses in the wind is very soothing and relaxing. I don’t cut the grasses back until early spring so that the ‘feathers’ create winter interest in the garden. 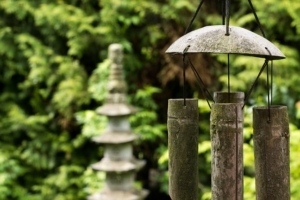 Meditation is enhanced when there are focal points in the garden. We have several including the water fountain, wind chime, a statue of the Virgin Mary, a peace pole, an Anemoi (wind god) bird feeder which hangs on the church wall and the stained glass windows. While the walkways through the garden have challenged us in some ways, in other ways they encourage visitors to explore other areas of the garden. I always attempt to incorporate some feng shui principles in any garden that I design/create. Right angles trap the flow of good chi and create dead spaces. Circles and curves deflect bad chi and create good energy in the space. I temper all the right angles with as much round as possible. While I can’t block the noise from Main St. West I can block the view and the negative chi that all the vehicular traffic pushes on to the church property. Instead of right angles the side walks have curves. Tall burning bushes block the view of the street. A hanging wall garden softens the entrance to the office door. Round urns filled with ferns make wind flow through the garden even against the stone wall. It is impossible to dispense with all right angles but a look through photos on the internet of Japanese or Chinese gardens will give you some great ideas. I attempt to incorporate some medicinal plants into the garden or plants that have spiritual significance. Probably the most popular is lavender. 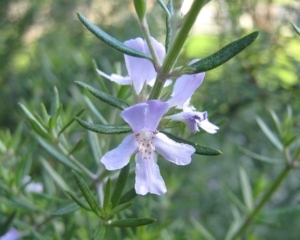 A quick pinch of the leaf or flower will give you fragrant oil on your hands to inhale while in the garden. The statue of the Virgin Mary calls for flowers that complement meditation on her virtues such as lilies, roses, lily of the valley, iris, lady’s mantel and daisy, all of which you will find in our healing/meditation garden. Sometimes it is difficult to hide the ‘ugly’ things in your garden. In our garden the air conditioner compressor is hidden behind lattice. I plant palms in front of the rain barrels to camouflage them. A bit of an unattractive bench that was in the location before the garden is softened with pots of flowers. But, I don’t hide the well worn downspouts from the roof as they create an antique look against the beautiful stone walls of the church. Ours may sound like a huge garden at an enormous cost but it isn’t. A healing/meditation garden can be created in any space, regardless of the size, if some of the above principles are included. Many of our plants are perennials that have been divided several times. Family, friends and members donated plants and gave us the statuary which also includes a statue of St. Francis of Assisi. Rome wasn’t built in a day and neither was this garden. It was a dream that required planning, research and hope and then when the time was ripe it seemed to almost grew out of the ground by itself! I hope you have enjoyed this tour of the Healing/Meditation Garden at Grace Lutheran Church in Hamilton. Please stop by for a visit!